Algebraderci! This post might be the last ALG post (at least for a while). Fittingly, perhaps, we devote this week's task to rules of single and double false position, which are methods that go back about 2000 years and that surfaced in many parts of the world - China, Egypt, the Arab world, India and, eventually, Europe. It is not clear whether the methods spread from one region to another, or were discovered/invented spontaneously in several regions. They were generally used to solve practical problems and as such were known not just to mathematicians but to people such as merchants who would use them as algorithms, ie as rules that worked rather than as rules that needed to be justified and proved. The rules apply to situations that we would now represent with linear or affine equations, ie equations of the form y = ax and y = ax + b respectively. However the rules were devised many centuries before symbolic algebra was invented, and continued to be used for some centuries thereafter. MONDAY: We start with a problem taken from the Eygyptan Rhind Mathematical Papyrus (RMP), which dates from about 1550 BC and was written by a 'copyist', Ahmose, who claims to have been copying work from one or several centuries earlier. This particular problem is quite straightforward, and certainly doesn't need formal algebra, though that provides one way of solving it. We present it here to illustrate the rule of single false position, which is the way it is solved in the RMP. 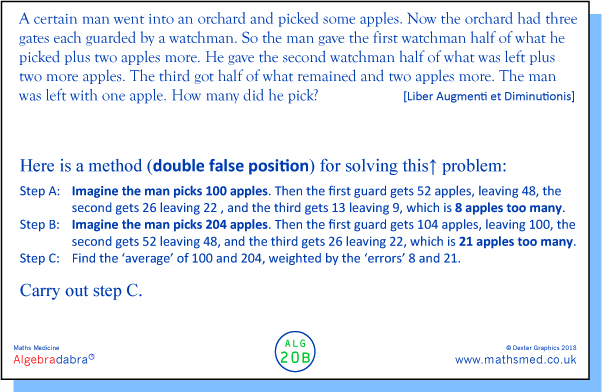 The above problem is Problem 26 in the RMP. Problems 24, 25 and 27 are similar, though interestingly they would seem more complex to us than Problem 26, since their solutions are all fractional. In fact, the first three problems appear to get progressively easier! Something to think about, for the small-stepping devotees of 'intelligent practice'. 27: x + x/5 = 21. 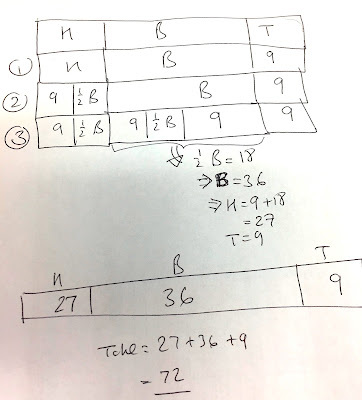 TUESDAY: We show how a problem can be solved using the rule of double false position - or rather, we show the first two steps, and leave it to the reader to complete the method. We provide some help with the final step in Wednesday's version of the task. 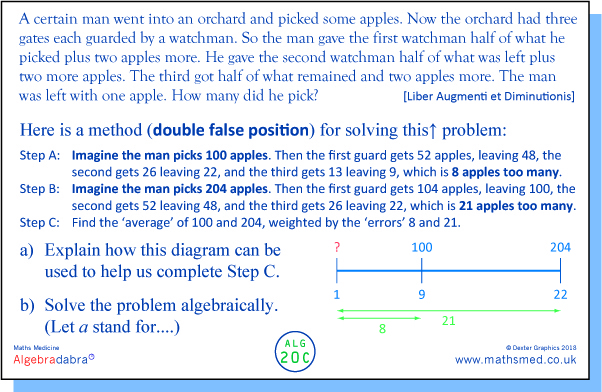 Note: We came across this Apples task in a very useful conference paper by Schwartz, presented in 2004. Schwartz gives the source of the task as the Liber Augmenti et Diminutionis: "This book, probably from the 12th Century, is the translation of some now-lost earlier work attributed to one 'Abraham' and generally believed to have been written in Arabic or Hebrew" (ibid). 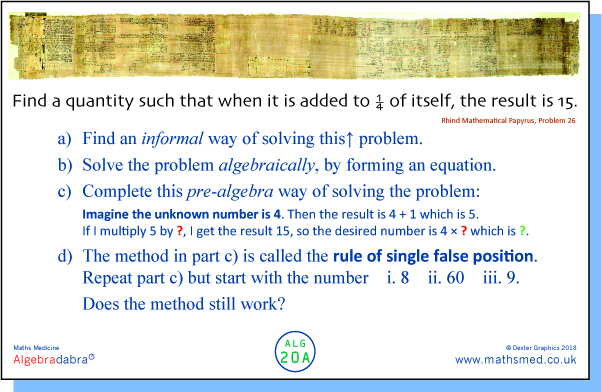 The task can also be solved algebraically, though it wouldn't have been in its day. Interestingly, an algebraic approach turns out to be very cumbersome here, compared to the use of double false position. WEDNESDAY: We revisit Tuesday's task but use a diagram to help make sense of the double false position rule. The general form of the rule is (x₁e₂ – x₂e₁)÷(e₂ – e₁) which, presented rhetorically, would in ancient times probably have been treated simply as a practical algorithm to be learnt and applied. 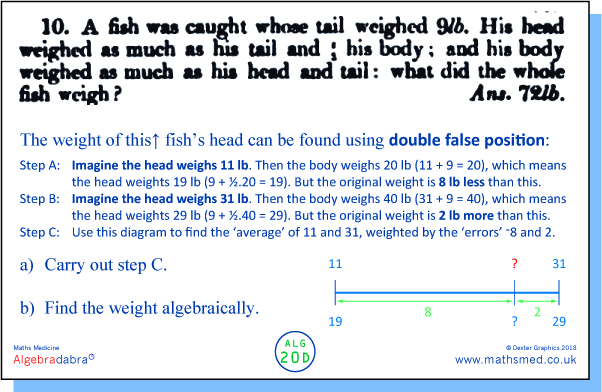 THURSDAY: We apply the double false position rule to parts of a fish.... This problem was probably written by de la Grange. It appears in the 1822 translation into English of Euler's Elements of Algebra. 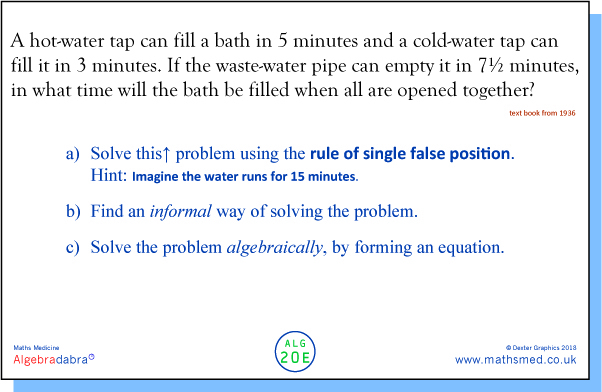 The intention would have been to solve the task algebraically, using simultaneous equations. However, it also lends itself very nicely to the double false position approach. Here's a nice bar-model approach (thanks to Bernie Westacott). 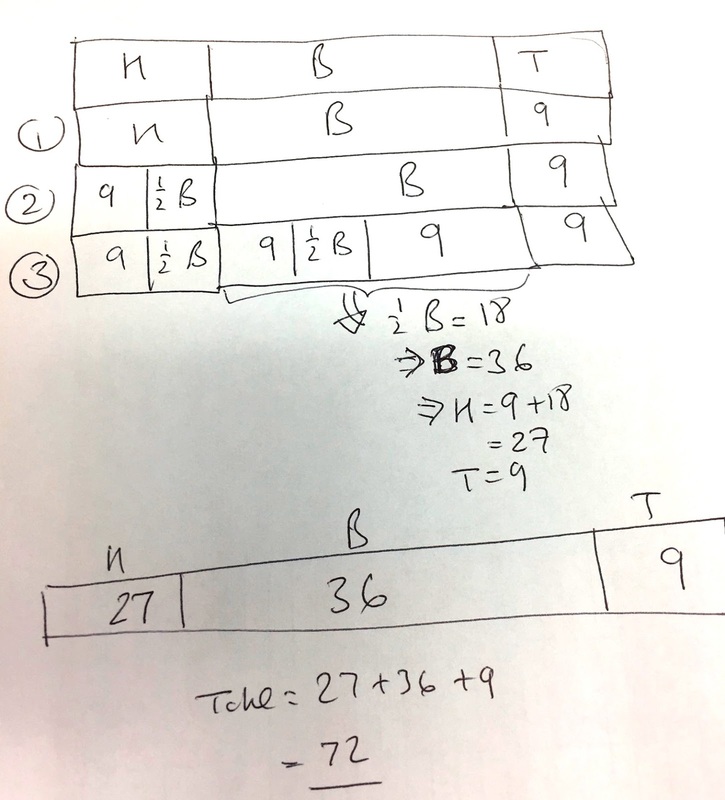 One can see how it corresponds to an algebraic approach using simultaneous equations. FRIDAY: Friday night is bath night and we take a (classic) bath.... This type of problem goes back centuries, though this one is only from 1936 (it is quoted in a paper co-authored by Arcavi). The problem is remarkably easy to solve using single false position. A greater challenge is to find an informal method - to start with, it might be helpful to simplify the task slightly, by ignoring the waste-pipe, ie by putting the plug in the bath. Valediction: 20 sets of task, that's 20 weeks or almost 5 months of algebra tasks, 100 in all. Time to say Algebraderci (at least for a while). © Dexter Graphics. Simple theme. Powered by Blogger.